This interview is all kinds of adorable. With a little dollop of awkward. 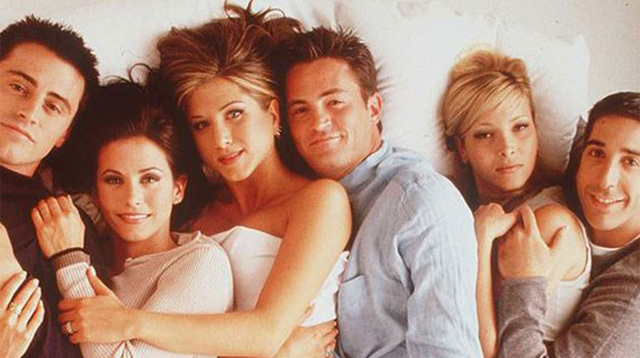 Way back when (cough, in 1995), Friends was just coming to the end of its first ever season. The cast was making their debut on Oprah and were all in their mid-late twenties. What happened was a piece of ‘90s TV genius which we must #neverforget. They have a good old chat about not being that famous (oh guys, you’re really in for a TREAT), and Jennifer Aniston actually says the following about being stopped in the street: “I don't get it as much as these guys and I don't feel it has changed my life this much." They’re all so adorable and awkward and ‘90s, it actually hurts. Oprah caught up with gang nine years later just after the last episode had aired. And this bit is so sad we almost don’t want to say it. Oprah asks each of them about the craziest rumours they’ve read about themselves in gossip magazines. Jennifer lists all the bizarre things she's read about her relationship with Brad Pitt. "[They've said] Brad's on a movie and they're in trouble. There was a period where I was living in a hotel and Brad was somewhere else. So, they had us divorced and that was funny." This interview took place in May 2004 and the film Brad was away filming at the time was Mr. and Mrs. Smith aka the movie he fell in love with Angelina Jolie on.